In anticipation of the future of healthcare and technology, the Consumer Technology Association (CTA), in conjunction with the American Heart Association (AHA), sponsored a day of CME accredited events at the 2019 Consumer Electronics Show (CES) January 7-10 in Las Vegas, Nevada. 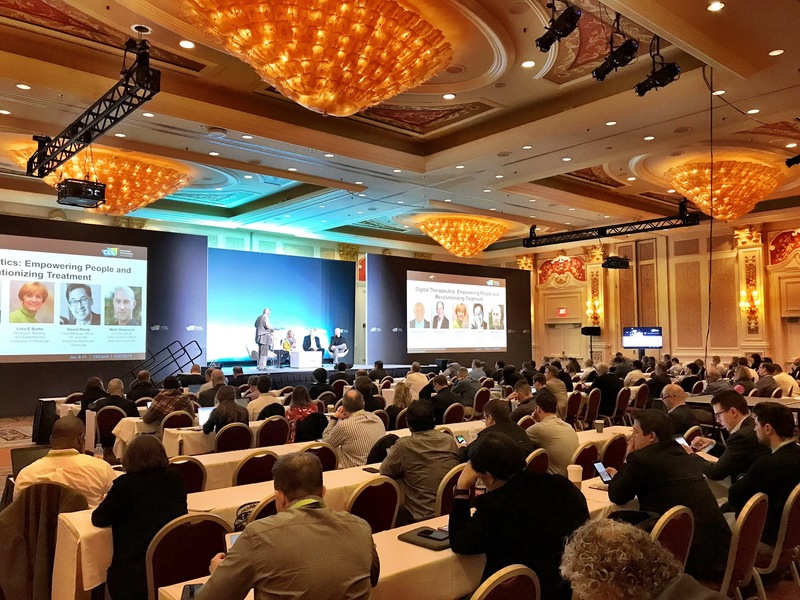 Casey Albertson, President of PatientBond, was invited to participate as a panelist for the session, “Digital Therapeutics: Empowering people and Revolutionizing Treatment.” More than 200,000 people attended the 2019 CES and 262 people paid to attend these CTA sessions. Moderator Dennis Robbins, Ph.D.,MPH: Dennis is committed to rejuvenating healthcare eco-systems and shifting the paradigm from patient to person. Lora Burke, Professor of Nursing and Epidemiology, University of Pittsburgh: Dr. Lora Burke has a long-standing record of NIH funding to support her research program, and her significant contributions have been nationally recognized as she has been made a Fellow in the American Academy of Nursing, the Society of Behavioral Medicine, and the Council on Cardiovascular Nursing. Matt Omernick, Co-Founder and Chief Creative Officer, Akili Interactive Labs: Akili Interactive is a digital health company pioneering clinically-validated, physician-prescribed, consumer quality video games. Working with leading Cognitive Neuroscientists, they are developing the first truly therapeutic mobile games to treat cognitive illnesses such as ADHD and Autism. Dr. David Rhew, Chief Medical Officer (CMO) and VP & GM of Enterprise (B2B) Healthcare, Samsung: During this time period as VP and General Manager for the Enterprise (B2B) Healthcare Vertical for Samsung Electronics America, the Healthcare Vertical has achieved +230% revenue growth year-over-year. Their mission is to deliver transformative digital health solutions, and they have achieved amazing results using virtual reality programs to reduce pain. Casey Albertson, President, PatientBond: As President of PatientBond, Casey Albertson is responsible for business development, in the form of both sales and industry partnerships. PatientBond is a cloud-based, targeted, healthcare engagement platform leveraging psychographics and dynamic digital communications to amplify results. PatientBond has delivered significant improvement among patients/members in variety of clinical settings, and a wide range of marketing applications such as acquisition and loyalty of patients/members. The panelists discussed the role of technology in driving positive patient behaviors and health condition interventions. It was agreed that technology has a significant role to play, but it’s not sufficient as a standalone in clinical trials or the delivery of optimal patient care. Technology cannot be “pushed” onto a patient; the patient must understand a technology’s benefits and it must be positioned in terms of a patient’s motivations and priorities. Dennis Robbins stressed that healthcare needs to be person-centric, not patient-centric, because people do not define themselves by a health condition. One must have an appreciation for the patient as a whole, recognizing that the vast majority of a patient’s time is spent outside the walls of a medical practice. It’s important for healthcare providers to understand patients’ attitudes, needs and priorities to offer more effective care. Simply providing information about a health condition or treatment regimen is not enough to motivate patients. Lora Burke supported this perspective, indicating that in obesity, people do not need more education, they need coaching, motivation and proper rewards to incentivize appropriate behaviors. Underscoring the potential for technology, however, Dr. David Rhew shared case studies on the use of Virtual Reality programs to significantly reduce chronic pain among the toughest-case patients. Matt Omernick discussed how the use of video games among children with ADHD (max 22 minutes per day) can aid treatment and is being studied on its reduction in the use of pharmaceutical products. Virtual Reality and video gaming have shown encouraging results in situations where prescribed medications have failed. Casey Albertson discussed how targeted messaging using a patient’s psychographic profile can enable the delivery of the right technology solution with the right timing. Because psychographics pertain to people’s attitudes, values, beliefs, lifestyles and personalities, these insights can inform interventions that significantly enhance patient response rates and actions. Mr. Albertson discussed the application of psychographic segmentation and digital engagement to improve cardiovascular outcomes. Technology offers much promise in optimizing health and healthcare delivery; however, technology alone is not sufficient. The human factor must be considered, among both patients and clinicians. A combination of healthcare professionals’ efforts, technology, patient data and consumer understanding has the best chance of success.